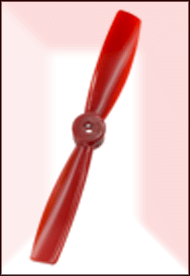 The DALprop New 5045BN Bullnose Red 5x4.5 Props come as a set of four including 2 CW and 2 CCW propellers. They have a 5mm hub and are made of PC and glass fiber material which makes them very strong and resillient to breaking. With a set of DALprop propellers on your multirotor you can often clip tree branches, bump into things, or even crash and just keep flying. These propellers pair very nice with the very popular 2204, and 2205 motors used on many 230mm, 250mm and other size quadcopters and hexacopters supporting a 5 inch propeller. The BN style prop is a true bullnose prop that has a straight cut bullnose tip.